Regardless of their shape and size, our dogs are filled with unconditional love. But some pooch lovers will argue the bigger the dog, the bigger the heart. Sure they eat more food, and can take up more of the bed, but big dogs with their sweet and gentle temperaments make great family pets. We have a number of large, lovable dogs waiting for their new best friend to walk through the shelter doors. 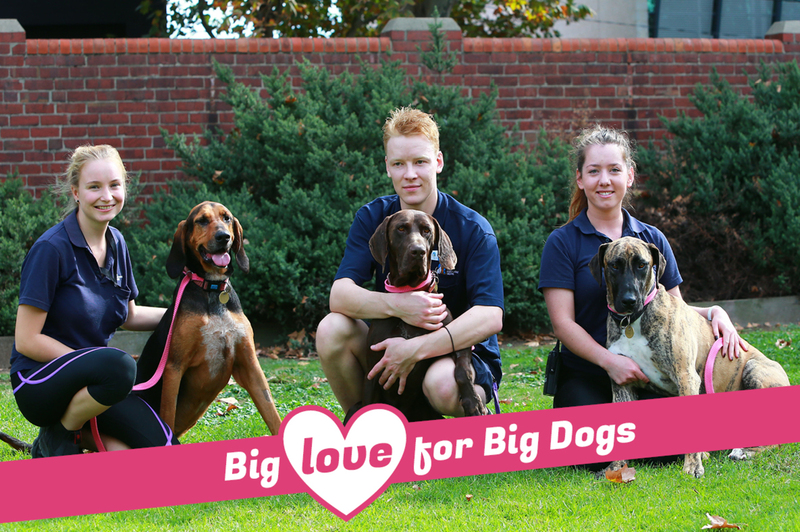 Today we are featuring just three of our big hearted dogs, could you be the buddy they are looking for? Mastiff cross Paul is a large and lovable dog who enjoys nothing more than lounging in the sunshine and long walks with his favourite people. He enjoys positive reinforcement training and spending time with other dogs. During his time at the Home this two year-old softie has been working on building his confidence and managing his separation anxiety with the behaviour team. Paul needs an owner who is committed to his ongoing training and socialisation. They will also need to help this big hearted dog to settle into his new home. However, with a little patience and care Paul’s new owners will be reward with loyal and loving lifelong companion. Soulful Molly is a big dog, with an even bigger heart. This six year-old bloodhound cross enjoys spending time with those closest to her frolicking in the sunshine and playing with her favourite plush toys. Friendly, quiet Molly enjoys her training classes and would thrive with an owner committed to keeping her and mentally active. She will also suit a home with other, suitably matched, dogs to keep her company. Molly does have moderate hip dysplasia, but this can be managed with a good quality diet and low impact exercise. With care and love Molly will bring sunshine into the lives of her new family. Handsome and charming, five year-old German short-haired pointer cross Jack loves people and is looking for a family who is willing to make him a big part of it. Jack has had some surgery on an old rib injury, so he is a little weary of being handled. While his injury is healing on its own, Jack’s new owner will need to watch out to make sure no one accidentally pats him over his sore areas while they are healing. Full of energy, Jack will need an owner who is just as active to keep him physically and mentally satisfied. Regular exercise is a must and this personality plus canine will benefit from some structured training to keep him mentally active.